Wendy Johnson joined us as guest editor to explore how, as dharma practitioners and concerned citizens, we can take in and respond to the deep-rooted causes and conditions of hunger. 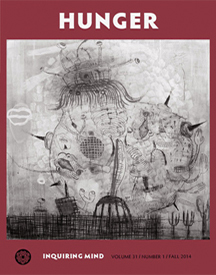 Cover art: Heather Wilcoxon, “Nothing Makes Sense,” 54″ x 54″, multimedia on canvas. This next-to-final issue of Inquiring Mind is dedicated to the many guises and manifestations of hunger. Guest editor Wendy Johnson offers her thoughts. Bhikkhu Bodhi compiled an annotated list of links to organizations working on hunger relief and related environmental issues.